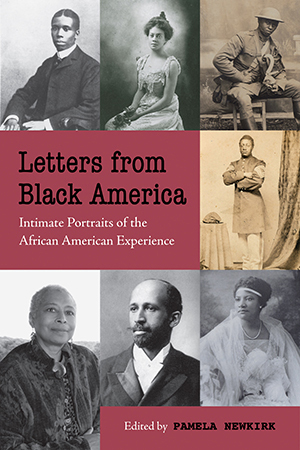 Letters from Black America fills a literary and historical void by presenting the spectrum of African American experience in the most intimate way possible-through the heartfelt correspondence of those who lived through monumental changes and pivotal events, from the American Revolution to the war in Iraq, from slavery to the election of Obama. Roscoe Conkling Bruce to Clara Burrill: January 3, 1903 Dear heart, I have missed you a very great deal - how much no mortal but me can quite realize. (You, dearie, are an immortal!) I think of you literally all of the time. In my office my mind refuses to bind itself to routine duties and insists upon planning dresses and tomes and receptions and the Lord knows what for you. I love you, darling, with all my soul. My life you are. I pray that we may be always the creatures of poetry and romance that now we are; I pray that I may make you always happy; I pray that your life will not be narrowed by marriage but enlarged: I pray that we may be useful and worthy always. Let us, whatever comes, never forsake our scholarly interests; let us never degrade our ideals; let us always live on the summits of experience; and let us always be simple and noble and sensible and just..
My darling, So busy have I been during the last few days that I haven’ t had time to write to my darling but I have thought of him continually. Indeed, dearie, I have found difficulty in studying for my exams so wholly have all my thoughts been with you. You may be surprised to hear it, but I find more pleasure in thinking of you than I do in studying for mid-year exams ... Oh dearie I shall be so happy when I am with you always. And, dearie, let’ s do all in our power to make others happy. Let us not be selfish in our love. Let us not leave our mothers alone and have them feel that in their last days they are unloved .I want Mama to feel that as long as we have a home she has one too. I hope you’ ll let her know. Dear Little Daughter: I have waited for you to get well settled before writing. By this time I hope some of the strangeness has work off and that my little girl is working hard and regularly. Of course, everything is new and unusual. You miss the newness and smartness of America. Gradually, however, you are going to sense the beauty of the old world: its calm and eternity and you will grow to love it. Above all remember, dear, that you have a great opportunity. You are in one of the world’ s best schools, in one of the world’ s greatest modern empires. Millions of boys and girls all over this world would give almost anything they possess to be where you are. You are there by no desert or merit of yours, but only by lucky chance. Deserve it, then. Study, do your work. Be honest, frank and fearless and get some grasp of the real values of life. You will meet, of course, curious little annoyances. People will wonder at your dear brown and the sweet crinkly hair. But that is simply of no importance, and will soon be forgotten. Remember that most folk laugh at anything unusual whether it is beautiful, fine or not. You however must not laugh at yourself. You must know that brown is as pretty as white or prettier and crinkly hair as straight though it is harder to comb. The main thing is the YOU beneath the clothes and skin -- the ability to do, the will to conquer, the determination to understand and know this great, wonderful, curious world.... [Don’ t shrink from new experiences and custom. Take the cold bath bravely. Enter into the spirit of your big bedroom. Enjoy what is and not pine for what is not. Read some good, heavy, serious books just for discipline. Take yourself in hand and master yourself. Make yourself do unpleasant things, so as to gain the upper hand of your soul. Above all, remember your father loves you and believes in you and expects you to be a wonderful woman.] I shall write each week and expect a weekly letter from you.